Listed below are my 2017 IDP Rookie Rankings. I will periodically update these throughout the off-season to reflect changes in free agency, defensive schemes, playing time, draft selections, etc. 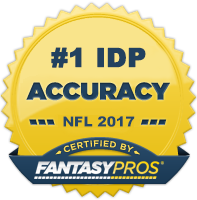 However, keep in mind that the information listed here is just a small sample of a much larger set of rankings and descriptions that are accessible through purchasing my 2017 IDP Fantasy Football Draft Guide. The Lions were dreadfully thin at linebacker heading into this year's draft, so it's no surprise that they are expecting first round pick Jarrad Davis to be an "immediate contributor" at the position. The Florida alum will start at middle linebacker out of the gates and likely have a three-down role. Given the recent success of a middling talent like Tahir Whitehead in that spot, it’s quite likely that Jarrad Davis will finish as a strong LB2 and fantasy's top rookie linebacker in 2017. Early in the draft season, many experts considered Foster to be the top off-the-ball linebacker prospect and there were indications he could be drafted as high as number two overall. However, concerns over his surgically repaired shoulder and a couple off-the-field incidents caused him to slide all the way down to the second-to-last pick in the first round. If healthy, he has the skill set to be a dominating, every-down presence. With whispers of Navarro Bowman’s potential release heating up, Foster may become the centerpiece of the defense sooner than many expect. Given his pedigree and the high amount of expected tackle opportunity, Foster has the best long-term upside of any rookie linebacker. Garrett was considered by many to be the best prospect in this year’s draft, so it came as no surprise when the Browns selected him with the first overall pick. Rookie defensive ends usually take a couple years to develop into viable fantasy starters, but Garrett could very well buck that trend as he has an NFL-ready skill set and defensive coordinator Gregg Williams has done a nice job getting the most out of young pass rushers throughout his career. The Jets used the sixth overall pick on Adams who should become an immediate starter in New York's secondary. David Harris is no longer with the team and Darron Lee underwhelmed as a rookie, so Adams should see ample tackle opportunity on a defense that is expected to be on the field a lot. He's the favorite to lead all rookie secondary players in tackles and production similar to Landon Collins in his rookie season is quite achievable. The Cardinals helped shore up the instability of their linebacking unit by selecting Haason Reddick with the 13th overall pick in this year’s draft. Reddick spent most of his time as a pass-rushing, outside linebacker at Temple where he generated 17.5 career sacks. However, he’s also capable of holding his own at inside linebacker – a position in which he will start his career with Arizona. The coaching staff has been very pleased with his performance during OTAs and with Deone Bucannon likely to start the year on the reserve/PUP list, Reddick has an opportunity to nab a starting spot (at least for the first six games of the regular season). Although he may head back to a part-time role upon Bucannon’s return, he has the long-term potential to be a top 15 player at the position. Cunningham led the SEC in total tackles last season with 125, earning first-team All-America honors. He projects as an every-down linebacker who could eventually supplant Bernardrick McKinney as the team’s primary defensive play-caller. He could still use another year of development to fine-tune his technique and doesn’t have a clear path to playing time right now, so 2018 is likely the year he begins to make a fantasy impact. McMillan was a five-star recruit coming out of high school and led the Buckeyes in tackles in each of the two seasons he started for the team. He struggled in pass coverage at times in college however so there are some concerns that he may only be a two-down, thumper in the pros. This makes him a less attractive fantasy option compared to Reuben Foster, Zach Cunningham, or Haason Reddick, but he’s still a top 15 IDP rookie. Thomas, the number three overall pick in this year’s draft, has drawn a lot of comparison to Michael Bennett for his strong run defense skills and ability to rush the passer from both the inside and outside parts of the line. Expectations are that Thomas will play defensive end in the base defense and slide inside to a three-technique role in passing situations. If he truly does play a majority of time at the 4/5 technique, his sack upside would likely be capped. He projects as a long-term DL2 fantasy commodity. Barnett was one of the SEC's top defenders and broke Reggie White's school sack record of 33 while at Tennessee. Although he’s not the most explosiveness player, his sound technique, above average strength, and relentless motor make him a consistent pass rushing threat. He would have a much more favorable immediate fantasy outlook if not for the crowded Philadelphia front four. He's a rookie that may not see a ton of playing time in year one but could quickly explode onto the scene in 2018 as a top tier fantasy lineman. Peppers was a Jack-of-all-trades in college, playing 12 different positions while at Michigan. Although he provides the Browns with linebacker, cornerback, safety, and punt return versatility, the team’s biggest need is at safety so he will begin his career there. Defensive coordinator Gregg Williams loves to blitz, so look for him to leverage Peppers’ pass rushing ability (9.5 sacks during his college career) frequently. He should make an immediate fantasy impact and could eventually develop into an Adrian Wilson-type fantasy player. Charlton was seen as a slight reach by some draftniks given his limited production in college, but the Cowboys love his size and have one of the league's top DL coaches in Rod Marinelli to develop him into a solid NFL edge rusher. He has a good chance to begin the regular season as Dallas' starting RDE, so the opportunity will likely be there for him to produce. However, six to seven sacks are likely the best case output from him in year 1. Allen fell in this year's draft due to concerns over his past shoulder injuries but should start from week 1 for a Washington defensive line devoid of talent. He's perhaps the most NFL-ready defensive player in this year's draft class, but scheme and skill set may ultimately limit his upside.